Beginning this Friday, over 700 athletes from 44 nations will compete in five sports at the Winter Paralympics in Sochi. I am thrilled that NBC will be showing live coverage of the games for the first time ever, but I am kind of tired of the cold weather and the teasers of spring and summer that have been coming and going in Birmingham. Since in my mind I am at the beach, I’d like to focus on a warmer sporting event. 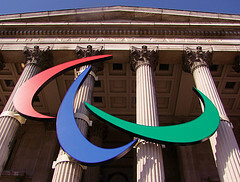 It is the third largest sporting event in the world behind the Summer Olympics and the World Cup; the Summer Paralympics. The games have come a long way from Dr. Ludwig Gutman’s Stoke-Mandeville Games, and the first official Paralympic Games, held in Rome, Italy, in 1960. During the London 2012 games, over 4,000 athletes, from 164 countries competed in 20 different sports. In 2016, athletes will compete in 22 different sports, with Paracanoe and Paratriathlon making their Paralympic debut.